We are closing in on the final winners for the Cybils. So exciting! For my category, Fiction Picture Books, I first posted at Booklights with the three titles I thought most likely to win a Caldecott. And I was right on two of them. Yes! Today at Booklights I’m sharing three more titles from the finalist list  one serious, one silly, and one downright dangerous. The seventh title I actually wrote about in December as a book that I was giving my three-year-old niece. I’m sharing that review here today as an appetizer to my other Cybils reviews. Plus because I love the book. 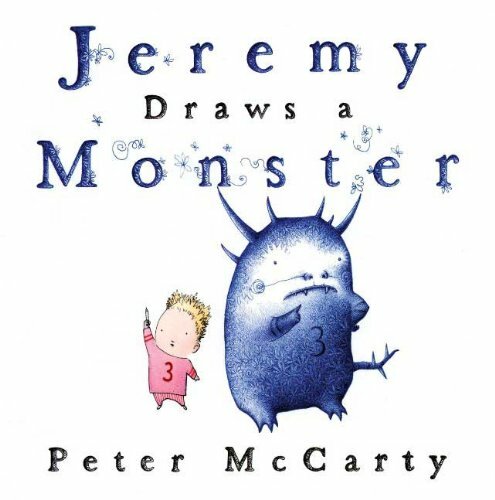 Jeremy Draws a Monster, by Peter McCarty, is one of my favorites of 2009, though it seems to have slipped under the radar for many. I didn’t think the amazing message contained within was too subtle, but maybe it did escape many readers who looked at the surface and saw a simple, light story. It’s a shame, because people missed one of the better combinations of art, story, and message that I’ve ever seen. In the simply written and illustrated book, Jeremy stays in his room, never goes out, and draws pictures. And one day, with his special crayon, he draws a monster. The monster is demanding and Jeremy has to keep working to satisfy it. He’s relieved when it goes out for the day. But can things end that easily? No. Only when Jeremy takes an active role in getting rid of his monster does he find a chance to be happy. Young kids will enjoy the story  especially as you read in the cranky monster’s voice  but can also absorb the deeper meaning within. Hopefully the adult readers will too. In my own family, after all enjoying this book, we’ve taken to saying, “You draw your own monster.” And we now see that you can’t feed it or ignore it, but you have to tackle it. An amazing message wrapped in a charming book with engaging illustrations. Not to be missed. I think this book resonated with me so strongly because I have people close to me who create their own monster of loneliness or fear, and don’t realize that they can’t give in to it or ignore it and expect it to go away. It’s a lesson that I wish we could all absorb when we are young and open, because it’s so much harder to change when you’re older and rigid. This weekend we have another snowstorm heading our way, and I’m going to try very hard to tackle my monster  clutter! I’ve certainly fed it, and ignored it, but I need to do something about it. What monster will you take on this month? I have a lot of monsters, I think! The illustrations for this book are charming, too. Had been looking forward to discussing awards books this weekend, but looks like the snow monster may intervene. Good to here your take on the nominees! I haven't seen this one yet--I just put a hold on it for the next time I go to the library. Thanks for the review! I finally got the book from the library. I agree: it's a gem. Thanks for sharing. Hope the snow hasn't kept you trapped.